In 1989 there was a fire at Leatherhead parish church which was for this restoration project providential. 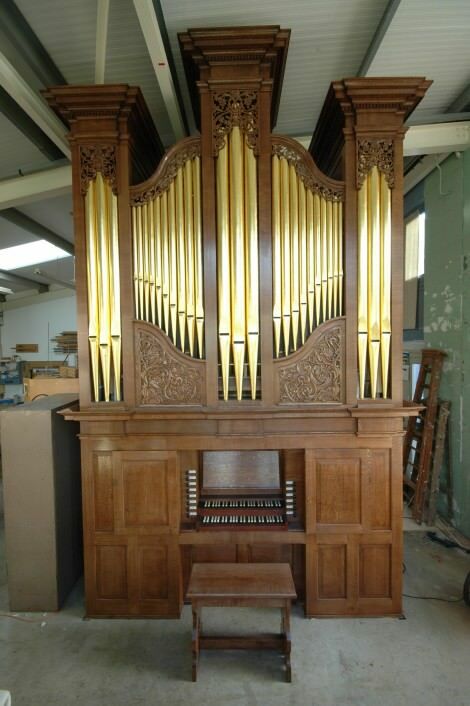 It rendered the Victorian organ unusable, but did not touch the parts of the 1766 organ, which had been re-used, and somewhat altered by Walker in 1873. The Georgian parts were identified and stored under the supervision of Martin Renshaw, who also researched the organ’s history. It appeared that the organ was not made for Leatherhead, but was moved by J.W.Walker in 1843. It was originally made for Watford parish church, but Walker had taken it in part exchange for a new organ in 1841. A payment for £163 was made to Thomas Parker by the churchwardens of St Mary Watford in August 1766. The pipe marks on the Leatherhead pipework, and the manufacturing style of the keys and pipes also show that they are by Parker. An increasing number of organs can be ascribed to him, but at present no church organs, though the large house organ built for Charles Jennens (librettist of Messiah) survives unaltered at Great Packington near Birmingham airport. This organ was used to supply all the information missing at Leatherhead. The organ was restored in 2007, as the culmination of a project which had been a long time in the planning. The funding mostly came through the Heritage Lottery Fund. For the church the project was directed by Mike Lewis. The opening concert was on November 24th with James O’Donnell playing with the Brandenburg Sinfonia directed by Robert Porter. Further information about the concert and the organ is available at http://www.parishchurch.leatherheadweb.org.uk/parkerorgan. Linda Heath the church archivist has written a booklet about the organ, which is available from the church. A restoration report with much technical information is available from the builders. The ranks marked * are wholly or partly original. The compass of the Great organ is GG C AA D to e³, and of the Swell organ c¹ to e³. The division of the bass/treble stops is at c¹/c#¹. The Walker shop books for 1843 describe the Stop Diapason and Trumpet as divided bass and treble – there was evidence on the surviving wind chest for the Trumpet but not the Stop Diapason. Similarly there was mention a shifting movement, but there was no sign of it on the chest. The pitch is determined by the surviving front pipes, where one can often see the alterations. In this case, some of the front pipes have what appears to be the original tuning length. They use a single slit for fine tuning (as at Great Packington), and with these the pitch was a¹=437.7Hz at 19°C. It is surprising that the pitch is so high, but perhaps there was a standard pitch for parish church organs, intended mainly for encouraging congregational psalmody. The tuning is based on “Harris the organ maker’s way of tuning his organs. By imperfect 5ths and the true octaves” in a harpsichord tutor of ca1704 by Godfrey Keller (and reproduced elsewhere), but with d# lowered so that the key of b major is not unusable. A meantone temperament of some sort would have been expected. This one is close to a fifth comma meantone, with the wolf spread between c#-g#-eb-bb-f. Such irregular meantone tunings seem to have been usual in England, perhaps for three centuries up to the middle of the 19th century. The tuning system was not discoverable from the surviving parts, and unfortunately it was one piece of evidence entirely removed from the organ at Great Packington (tuning slides provided for a recording in 1958). The Great wind chest and the keys survived from the original organ. The keys are unusual, in that the Swell is below the Great, and although the swell only uses the treble half of the keys, they are all cut out, as if this was originally intended for a Choir organ. The missing parts of the organ are all copied from the organ at Great Packington, which is almost the same size. The new oak case was made in our workshop and coloured and finished by Charles Marsden. The design is based on the drawing in the Sperling Notebooks (late 18th century) interpreted to accommodate the measurements recorded in the Walker Shopbooks and the surviving front pipes.